Excel’s true power starts with storing and analyzing data but really begins to jump of the page with Charts. 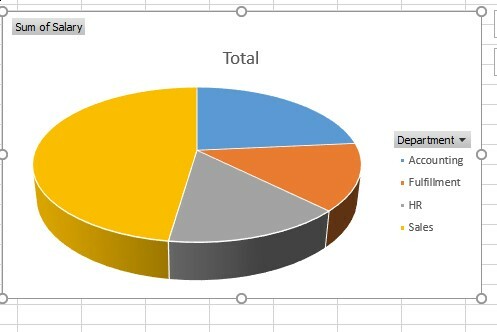 Excel charts allow users to graphically represent their data in a meaningful way. Users can easily create and customize charts. With the power of Charts, you can quickly summarize data, compare and track trends over time and see how your business is performing. You also have a tool to quickly report these numbers to colleagues and superiors. Today, we are going to focus on creating an Excel Chart. *When selecting charts from the Insert ribbon, they automatically appear on the same worksheet. Now, let’s say you wanted to take our Salary list chart and break it down even further. In this instance, we are looking at Total Salary by Department. And now, as you can see, we have a chart quickly showing the breakdown of salary by department. We here at Learn Excel Now hope you enjoyed these simple tips for getting started with Excel Charts. 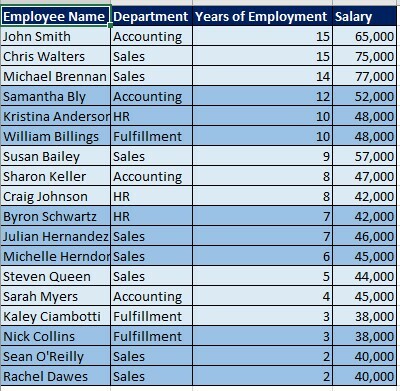 This just begins to scratch the surface of all the things you can do with Excel Charts, but shows the necessary beginning steps. Stay tuned for more Excel tips from Learn Excel Now. Like Learn Excel Now? Share this article and our other content with your social networks. This is great. By chance do you offer Tips on Word? The tips are great: relevant, well explained and generally useful.